Marie Dubsky was born at Zdislawitz Castle in Moravia (now Czech Republic) to an aristocratic Austro-Hungarian family. She began writing in childhood. In 1848, at age 18, she married her cousin Baron Moritz von Ebner-Eschenbach, a military officer. The young baroness became a leader of the literary salon attached to the Imperial court of the Emperor Franz Joseph in Vienna. She wrote popular plays and novels. Considered to be the most prominent of 19th-century female Austrian writers, she was famous for her epigrams, and produced a work of Aphorismen (1880). 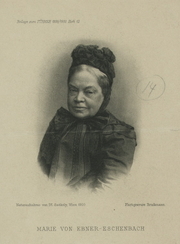 Marie von Ebner-Eschenbach became the first woman to be awarded an honorary doctorate from the University of Vienna. Marie von Ebner-Eschenbach is currently considered a "single author." If one or more works are by a distinct, homonymous authors, go ahead and split the author. Marie von Ebner-Eschenbach is composed of 7 names. You can examine and separate out names.